On November 28, 2018, 1428 units of dried cannabis jars were packaged by Up Cannabis. More than a month later, the product was recalled due to excess levels of mold and microbial contaminants. Unfortunately, this story isn’t uncommon. We’ve had two major romaine recalls due to E. coli outbreaks in 2018 and average about one outbreak per year for romaine and other leafy greens. The CDC estimates 3,000 people die each year due to foodborne illnesses. It’s not just the end customer who suffers. California just issued what’s being deemed the largest recall of cannabis product to date and it’s costing companies tens of millions of dollars. And these are only the stories we hear about. Newer technologies are hitting the market, including using imaging. Cameras are placed throughout the farm to capture images of plants and to detect disease before going to market. This is better, but it’s still a last-minute detection. Most of the crops we’re dealing with have fast growth cycles and are highly perishable, so detection needs to happen earlier. This is a massive problem for our industry. Farmers lose $76 billion every year due to plant disease. Clearly, growers need a solution. They need earlier detection and prevention mechanisms. That is why we’ve partnered with Scanit Technologies. Their proprietary technology is the best we’ve seen at early detection. They have a device, similar in shape and size to an Amazon Alexa. Devices are placed throughout your facility and autonomously capture spores. The solution then uses artificial intelligence to detect a pathogen before it affects your plants. Scanit now integrates directly into Agrilyst, so you can monitor, detect, alert, and act all before you lose a dollar in crop loss. There’s no need for multiple logins, we offer an all-in-one solution. We’re kicking things off with a few pathogens models, including powdery mildew and botrytis which commonly affect indoor growers. 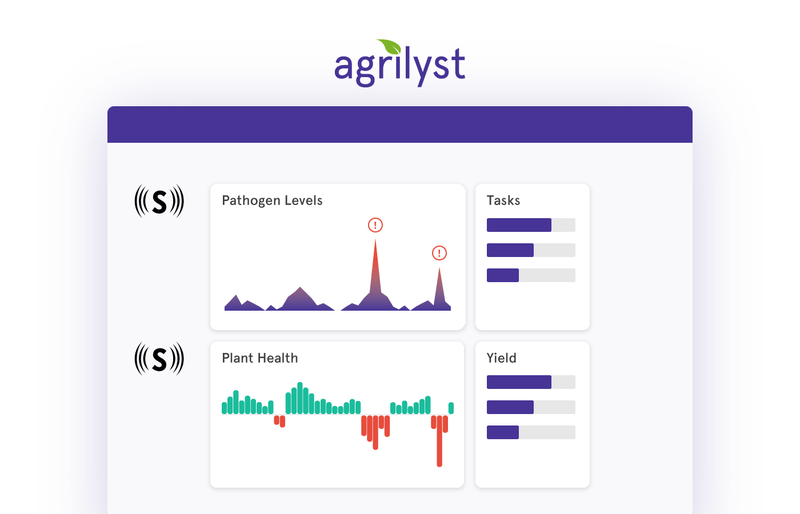 Growers can use Agrilyst to schedule batches, track crops throughout their growth cycle, forecast inventory, plan labor needs, assign workloads, track inputs, receive alerts, report on operations, and more. Now, growers will be able to check their Metrics hub in Agrilyst to see plant health analytics as well, which will include spore trend data. Owners and managers can simply sign up for an alert if a pathogen is detected, and workers can adjust operations as needed to fight off pathogens before they kill revenue.